A breakthrough platform for coin collecting and investing. 6375 different types of Chinese coins, medals and sets covering modern Chinese coins, Republic Imperial and Empire, Circulating and Medals. 3,114 sales have been added in the last 30 days! View the latest sales in chronological order with Timeline. Instantly see what has been selling including bargain buys and misinformed purchases. Never miss out on a coin in auction again. 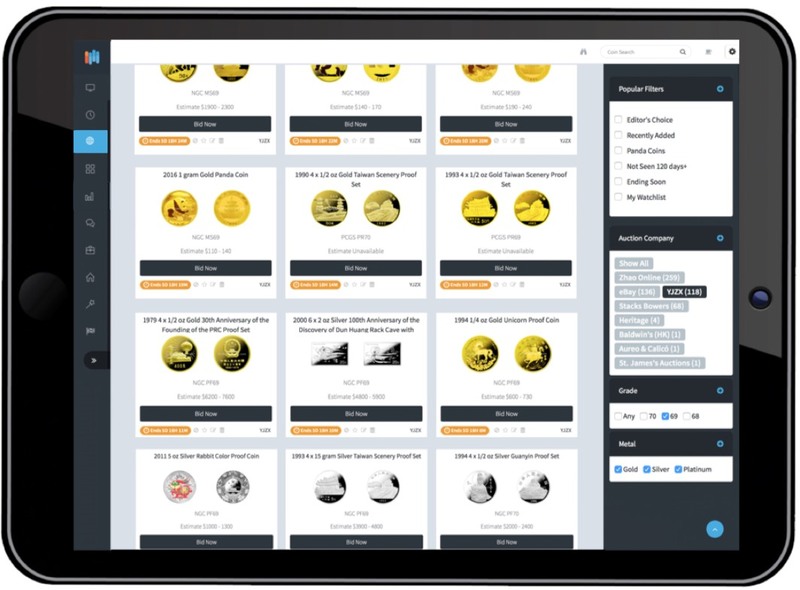 Our proprietary technologies identify Chinese coins in auction around the world and make them available in a convenient way to search, filter, research and bid; 0 right now. Add coins to watchlists in a simple and easy way to keep tabs on items of interest, display Charts and see latest sales, set SMS alerts when sales happen and more. 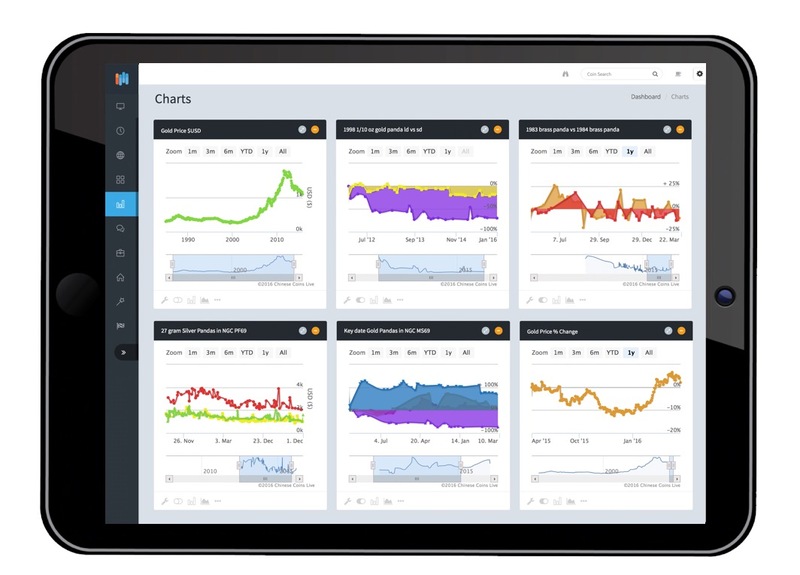 Extensive historical data sets and dynamic real time pricing info from our database that updates daily can reveal trends on charts. A simple intuitive platform to call the information you want on any Chinese coin, medal or set whenever you need it most. Tracking the latest sales from over 100 marketplaces and vendors, Chinese Coins Live is best positioned to keep you apprised of what is happening in the coin market in real-time. Our searchable historical sales database is unequaled going as far back as 20 years ago. Guaranteed to show you information you would otherwise never be able to access and save you a ton of time. Timeline is a chronological display of the most recent sales as they happen. See what is going up and down as it happens where you can search, filter and compare to recent previous sales of the same coin in same condition. View +/- % and +/- in actual values. We natively support six currencies which means whether you want the whole site in USD, CNY, HKD, EUR, GBP or SGD – all sales prices have been converted using the real exchange rates on the date of sale. Chinese Coins Live is also available in 100% Chinese. See video above. Never miss out on a coin in auction again. Live Auctions is giving you all Chinese coins in auction right now around the world. Filter by grade, metal or coin type. Search by keywords or year. 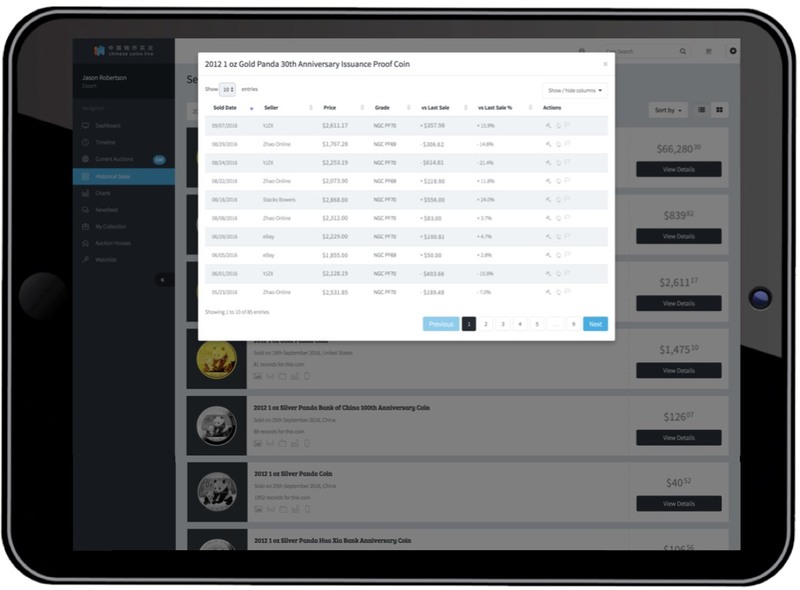 Spend less time searching and have more time to build your collection with the tools to do so intelligently so you can purchase at fair market values using proprietary structured coin data. Shortlist items of interest by adding them to your own watchlists. Compare any coins you want on Charts, enable SMS alerts for when coins sell or even go to auction, view actual sales in your browser and more. Create multiple watch lists to organize items as you wish. Export reports to PDF or CSV for insurance, collection tracking or performance. Define your interests to automate processes and protect your capital. It’s all there to work for you. Designed in California by numismatists to assist with building and maintaining coin collections. 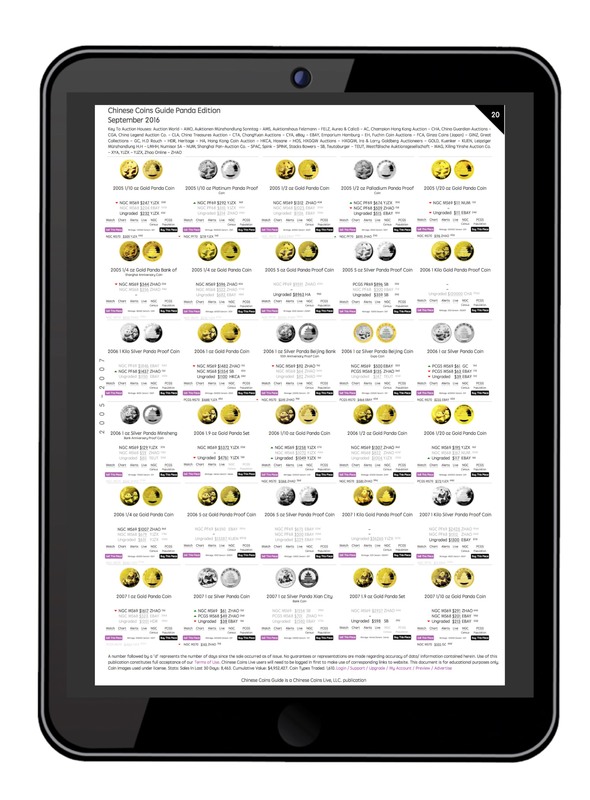 All of our vast structured coin data on Chinese Coins is there for you to compare, contrast and get never before possible insights. Track historical performance of a particular item in real values (price), or in % increase/decrease over any time period in a new visually intuitive way. Compare multiple coins against one another, spot trends or find optimal entry/ exit points and more. See all sales in any condition on a chart or compare a NGC MS69 coin against a PCGS MS69 coin. Limited only by imagination. 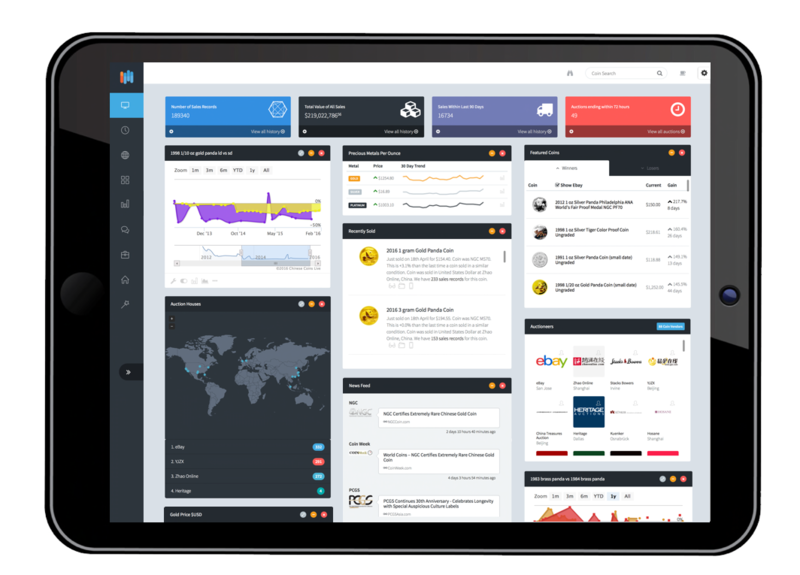 A customizable dashboard there to reflect your own unique interests. No two coin collectors are alike, the dashboard is there to show what you want whenever you log in. Your favorite coins on charts, a snapshot of the latest sales and market action along with many other features including precious metal prices, news and articles on Chinese coins and much much more. 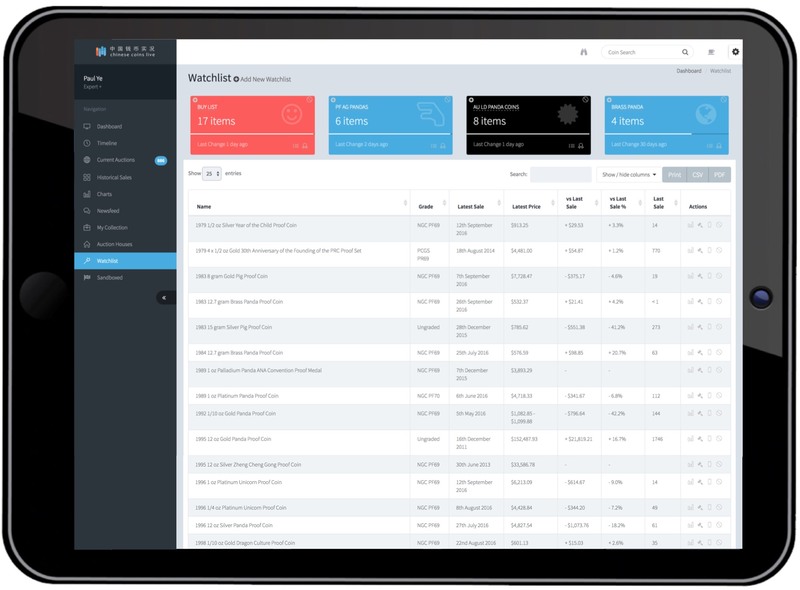 It’s all there to see as soon as you start your trial, you’ll be there in under 90 seconds. Chinese Coins Guide: The First and Only Structured PDF price guide with..